A science experiment can be an exciting time of discovery for kids and their parents. Many times, families struggle to find an experiment that is easy to do, yet follows the scientific method. Sometimes, in the middle of all the regulations and details of the science experiment, the fun gets lost, and along with it, the opportunity to learn. Our 24 Hour Science Projects guide has wonderful science experiments for kids! We are devoted to helping parents and students discover that science projects can really be fun. We’ve put our many years of experience with science experiments into packages of projects with hand-holding, step by step instructions. FREE! Get your copy of our Parent’s Guide to a Science Project. We know you’ll find a science experiment that will be perfect for the young scientist at your house! Is it time for your yearly school science project? When your students face the prospect of a school science fair, it’s usually up to parents to find the right topic. Many science projects are either too difficult for the average kid, or too simple to get a good grade. With four sons, we’ve had to do a school science project many times, and a couple of years ago, we decided that we would make our best science projects available to other families. We created packages of school science projects for kids that will help you get top marks from science fair judges, and your science teacher. The projects in our guides have step by step instructions that are easy to follow. The supplies can be found almost anywhere – you have a lot of them in your home right now. The experiments are fun to do, and lots of them can be finished in 24 hours or less. Best of all, they are available online for immediate download, so you can get started right now! Click here to get your science project guides – and be finished by this time tomorrow! • EGG-XPERIMENTING! Remove an eggshell without boiling, and find out if water will go through the cell membrane. • DON’T LOSE YOUR COOL Which kind of insulation works best? • VITAMIN “C”ITRUS Which fruit or juice has the most Vitamin C? This easy chemistry project will amaze your kids – and their teacher. • UNDERCOVER SNEEZE When you cover your mouth, does it really help keep you from getting sick? This easy science project is great for an elementary school science fair. • A SLICE OF ICE How does the shape of a piece of ice affect the time it takes to melt time? This cool science project will give you the answer! • A FLAKY SHOWDOWN Which brand of cereal stays crunchy in milk? A science experiment you can eat! • SLIP SLIDING? NO WAY! This project is great for car lovers! Find out which sort of floor covering prevents slips the best. • HEAR, HEAR Are two ears better than one? Wonderful for a group experiment. 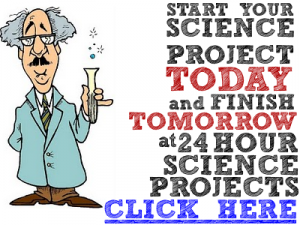 Click here to get your science project guides NOW. You can be finished by this time tomorrow! Often, for a science fair, the teacher lets children experiment on their own, as they want their students to jump start their curiosity and look into the world they live in for problems to solve or answers to questions. Sure, it is a lot easier to do home science projects for kids when the teacher spoon feeds the project, tells you what to do and how to do it. It is better for the children to learn to observe their environment on their own and create their own projects. Easy one day science fair projects using everyday things are often a way for the youngest students with short attention spans to learn about how a science fair project works and get results fairly quickly. Even older students can benefit from experiments that can be completed in a short time. Most science fairs expect the project to be investigatory in nature. Luckily, they are more fun and easiest kind to do. These follow along exactly in the steps of the scientific method: Observe, Question, Hypothesis, Experiment, Results. These experiments are the ones where you pose a question, then do a quick investigation which will prove or disprove your theory. These could be fun things like comparing the amount of citrus or Vitamin C in different fruits, timing how long it takes ice to melt in different scenarios, or you might see if the amount of whole wheat affects how long it takes bread to turn to toast. Older students might look at things closer to their interests, like seeing which hair products leaves the least residue, finding out how many germs are on their cell phones or putting pretty much anything in a box and dropping it from a high place, like a roof. Another kind ofone day, home science projects for kids might involve a demonstration. These are more likely to be part of a class project and not part of a full science fair. For these you are demonstrating how to do something or showing the effect one thing has on another. Demonstrating what happens when you pouring a carbonated drink on a rusty battery, or how to make a solar tea cup heater would fit this category. This is where you will find kids pouring two liquids together to get purple smoke or create some kind of gooey ooze. These short investigations or demonstrations can provide some oddball and fun looks at things we use everyday. Food is a popular topic and keeps the kids interest, particularly if the project can be eaten when finished! When you are given the opportunity to do a simple one day science fair project, take advantage of it and make it a fun and different twist to the things we see and use every day. Science fair projects can be such a great learning tool! Here are some great home science project ideas that are designed to use everyday things and can be completed in 24 hours, or a weekend. A special thanks to Sue Gnagy Fegan for her contribution of this science project article.